Here at Butler Vet, we celebrate all stages of life beginning with a wellness examination. For your pet’s wellness visit a thorough examination will be performed by a veterinarian. We offer a wide range of services depending upon the age of your loved one. Pre-purchase and behavioral advice, nutritional counseling, and grooming tips will help you develop a lifelong bond with your pet. Complete physical exams, regular dental care, and affordable immunizations help prevent diseases and detect problems before they become serious. We believe that the best pet owners are ones that are well educated. It is our goal to provide you with the knowledge to make the best choices for your pet. Puppies and kittens receive information at each visit about vaccinations, training and spaying or neutering. Your older pets stay healthier with more specific annual geriatric exams that can detect dental problems, cancer, heart disease, or other problems before they reach life threatening severity. 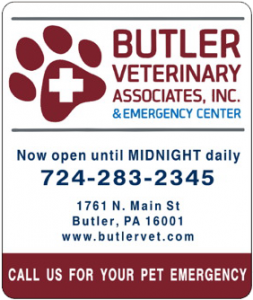 Butler Veterinary Associates offers a wide range of safe and effective pet products to help keep your pet healthy and happy. Monthly parasite preventatives are available by prescription. We can recommend a wide range of vitamin supplements, dental products, ear cleaners, shampoos, monthly flea and tick products, prescription diets, and much more.